Road trips are what we do. We haven’t taken a week-long vacation in almost 3 years but we do love to pack up the car and drive and luckily, the Northeast has a bounty of fabulous places to drive for just a weekend. Lake George, NY and Portland/Freeport, ME are two of our favorite weekend trips and we especially love Lake George and Adirondack State Park so much that we’ve been there 3 times in the past year alone. The Lake George region is a quick 3 hour trip and boasts some of the most spectacular lakes and mountain peaks in the Northeast. Unfortunately, a trip up to Lake George wasn’t in the cards for the Road Trip challenge but I put together a meal that would “travel well and still look great” and is one we could totally bring with us on our next trip to the North Country. 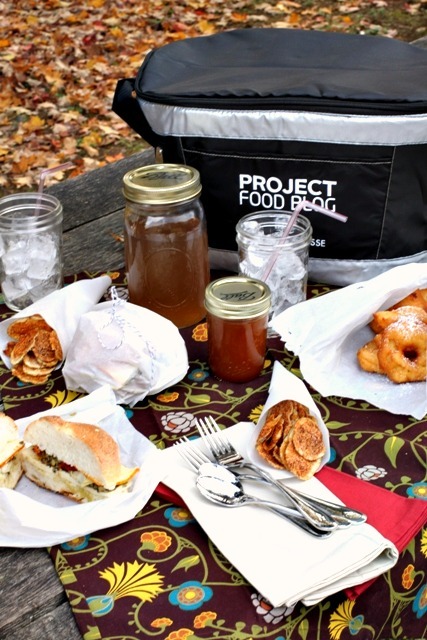 Project Food Blog asked us to “to whip up a entree, side, drink, and dessert to enjoy after hitting the road.” We took our picnic to the local Kettletown State Park, which is just a few minutes from our house. 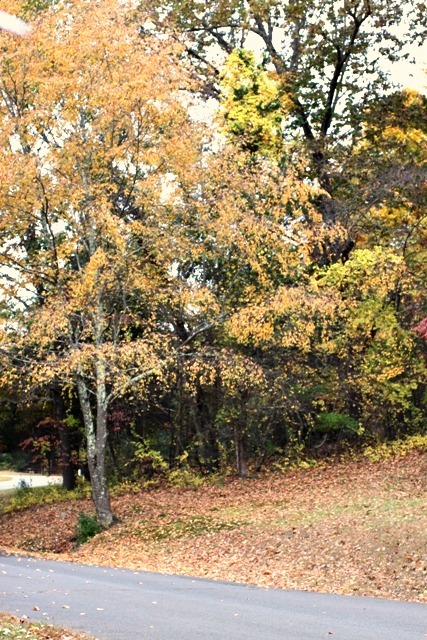 And let me tell you, this park is gorgeous this time of year so it was hard to resist for our picnicking spot. In all honesty, I was nervous that Kyle wouldn’t like the muffaletta. Neither of us like olives but I fell head over heels in love with this sandwich in August and since our tastes are so similar, I figured I’d try it out on him. And it turns out that he loved it just as much as I do. The flavors in the sandwich are very prominent exclusive of each other but they work beautifully together. Make sure the roll you choose to use for this sandwich is a sturdy one that can hold up to the filling. The Kaiser rolls I made this morning were absolutely perfect. I’d never made sandwich rolls before but decided to give it a go for this challenge – why not go all out, right?! Are you thinking, “microwaved potato chips? Is she crazy? ?” Well, thanks to Alice at Savory Sweet Life, I stumbled across this method just this morning and to save a few minutes and a ton of calories, I decided to give these chips a go. They were amazing!! 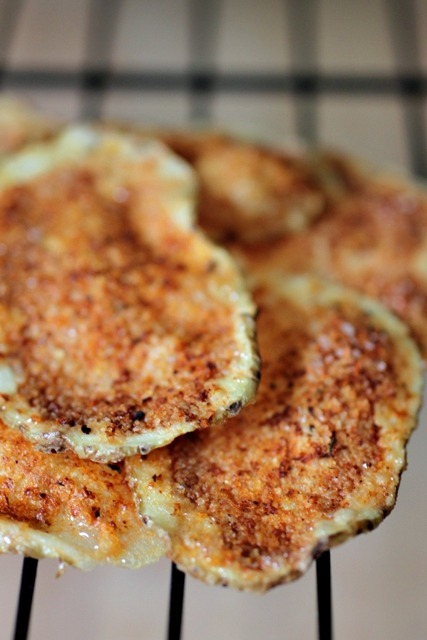 Who would have thought that paper thin potato slices would actually crisp-up in the microwave? I mean, really…nothing gets crispy in the microwave! But it actually works! These chips were so great sprinkled with a little sea salt and Cajun seasoning and remained crispy all day. I made little cones with parchment paper to transport the chips and surprisingly, they didn’t spill all over the cooler during the trip! 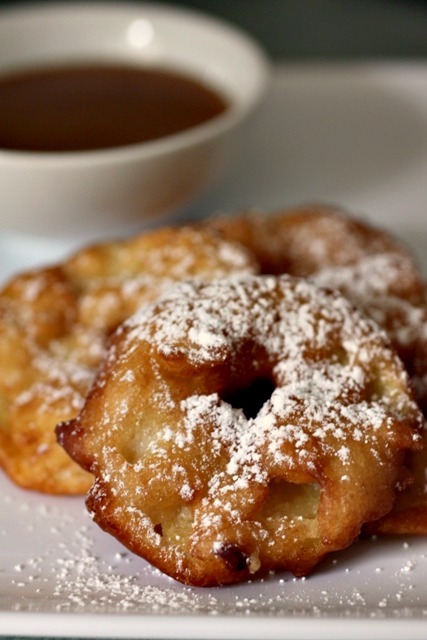 Once I decided on the NOLA-themed menu, beignets were the natural choice for dessert but it wasn’t until I came across this apple cider recipe with butter-rum caramel sauce that I really started getting excited about the menu. Fried dough + caramel = heaven!! Add some fresh apples to mix and you’ve got a stunning dessert to have at home or on the road. To transport the beignets, place them in some parchment paper and staple the parchment together to create a pouch for the beignets. Hold off on putting the powdered sugar on until you arrive at your destination. I poured the caramel sauce into an 8oz mason jar for the trip and brought a little bowl along for dipping. Easy!! Admittedly, drinks are not my specialty. For the most part, I drink water all day long, every day. I love my water but I was pretty sure water wouldn’t do for this challenge. It was Kyle who came up with the suggestion for ginger ale and I was sold immediately. Though it’s never the first type of soda I reach for, it’s always one that’s always refreshing when I do drink it. After checking out a few recipes, the one I ultimately chose was spot-on. Both the muffaletta and chips were on the salty side and this ginger ale provided the perfect amount of sweetness to complement the other parts of our lunch. For the purpose of this road trip, I poured the simple syrup and ginger-water into a quart-size mason jar and kept the club soda separate until we were ready to pour the ginger ale. We had a blast this afternoon on our Road Trip picnic in spite of the rain that started before we were ready to leave. After feeling like I’ve missed my last 5 weekends because of the time I’ve spent cooking and blogging, I’m so so happy to have been able to get outside and enjoy some time with Kyle. All of the dishes I made for this picnic couldn’t be easier for you to make and I hope you’ll give these recipes a shot the next time someone shouts ROAD TRIP!! 2. When ready to make sandwiches, spread 2 tablespoons of the olive salad on the cut side of each half roll. Divide cheese evenly between bread. 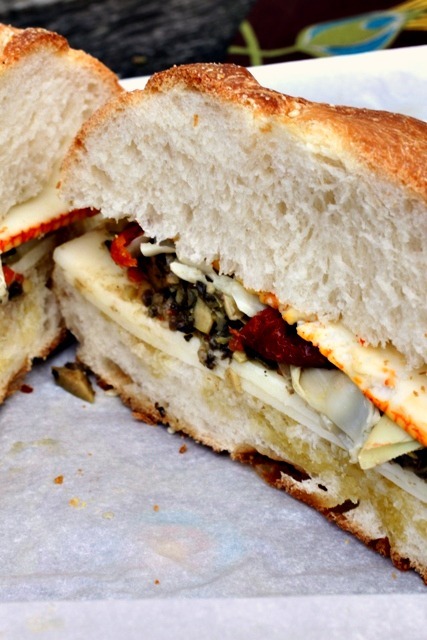 On the bottom half of each sandwich, arrange a portion of onion, artichoke hearts, and sun-dried tomatoes. Cap with sandwich top. Halve crosswise on the diagonal and serve. 1. Cut a piece of parchment paper to fit the inside of your microwave. 2. Carefully slice1/3 of a potato into paper thin slices using a mandoline, vegetable peeler, or sharp knife. You don’t want to cut any more than this because any extra slices laying around waiting to be cooked will turn pink in color. 3. Completely coat the parchment paper with non-stick spray and place the potato slices in a single layer. 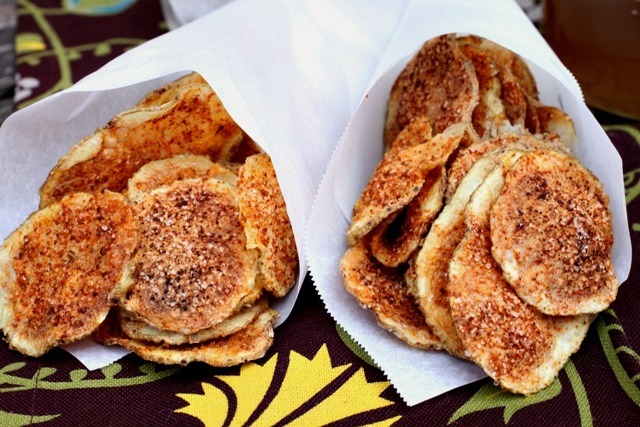 Spray the potato slices with non stick spray and lightly sprinkle with salt and Cajun seasoning. 4. Turn off the rotating option on your microwave and cook for 4-5 minutes. Cooking times will vary based on the strength and power of your microwave. Some chips may turn very dark brown. Ideally you want them light and golden. Also in my microwave some of the chips on the outside layer didn’t cook as quick as the ones towards the middle, so you may need to remove the ones in the middle and cook the outer ones for an additional minute. 5. Repeat the process until you’ve used your entire potato. To make the sauce:Heat sugar in a 12-inch heavy skillet over medium heat, stirring with a fork to heat sugar evenly, until it starts to melt, then stop stirring and cook, swirling skillet occasionally so sugar melts evenly, until it is dark amber. Stir in butter, water, rum, vinegar, and a pinch of salt (caramel will harden and steam vigorously) and cook over low heat, stirring occasionally, until caramel has dissolved. Add cream and bring to a boil, stirring, then remove from heat. Cool to warm. 1. Preheat oven to 250°F with rack in middle. Set a cooling rack in a large shallow baking pan.2. Heat 2 inches oil in a 5- to 6-quart heavy pot over medium-high heat to 375°F. 3. Meanwhile, peel apples and cut crosswise into 1/4-inch-thick slices. Cut out core with cutter, then pat apple rings dry. 4. Put 1 1/4 cups flour in a large shallow bowl and make a well in center. Beat egg in a small bowl with a fork, then stir in cider and 1 tablespoon oil and pour into well. Stir with fork until a lumpy batter forms. 5. Working in batches of 3 or 4, dredge apple rings in remaining 1/2 cup flour, shaking off excess, then dip in batter to coat, letting excess drip off, and fry, gently turning over once with a slotted spoon, until golden brown on both sides, about 2 minutes total per batch. Transfer to rack and keep warm in oven. Return oil to 375°F between batches. source: Simply RecipesThe amount of ginger you use in this recipe is up to you; use up to 1 cup for a strong flavor and 3/4 cup for a milder flavor. 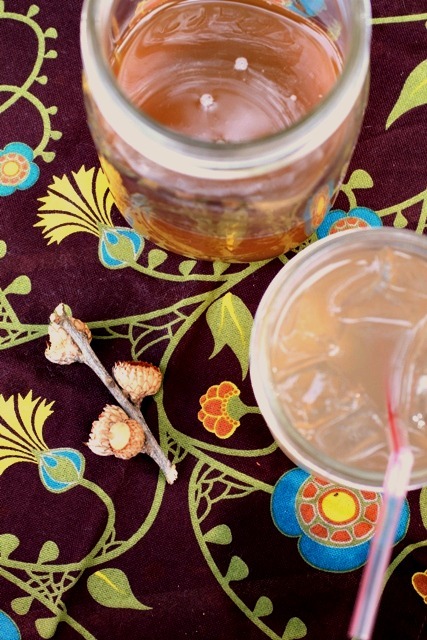 The ginger water is very strong on it’s own but add enough simple syrup to adjust for your own taste. I combined all of the ginger water and simple syrup and loved the extra level of sweetness the simple syrup provided. 1. Bring 2 cups of water to a boil in a saucepan. Add ginger. Reduce heat to medium low and let ginger sit in the simmering water for 5 minutes. Remove from heat and let sit for 20 minutes. Strain liquid through a fine mesh strainer. Discard ginger pieces. 2. In a separate saucepan, make the Simple Syrup by dissolving 1 cup granulated sugar into 1 cup of boiling water. Set aside. 3. Make individual (tall) glasses of ginger ale by mixing 1/2 cup of ginger water with 1/3 cup of Simple Syrup and 1/2 cup of club soda. Add a few drops of fresh lime juice and a lime wedge to each glass.